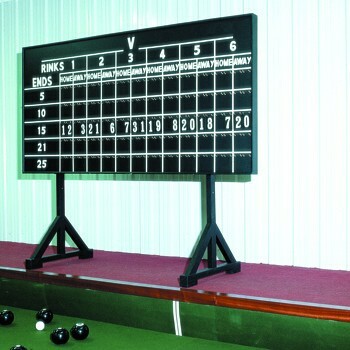 Top quality 6-rink scoreboard measuring 2.44m wide x 1.22m high. Manufactured from strong timber finished in matt black with white vinyl markings and lettering. Supplied with hang-on number plates 127mm x 76mm - 12 books 0-9 and 12 books of 1-3. Supplied with freestanding timber stand to suit. Can be supplied without the timber stand if preferred at reduced price. A 5-rink version is also available.